It’s been a long time since I wrote my last blog post. I apologize for the hiatus. This whole ‘having a baby’ thing hit me harder than I expected it would. I have been unmoored by the experience, and have taken this time to get back to what now is our ‘new normal.’ Baby Cole came early via C-section at 33 weeks after I started bleeding at home for the second time. Fortunately, he was big at 5 ½ lbs and only needed respiratory support for 2 days. Afterwards we played the waiting game while he learned how to eat and were finally able to take him home at three weeks of age. Having my family separated and an inability to fix it left me feeling like a failure on all fronts. My toddler didn’t have the language or comprehension skills to understand what was going on, only that his parents, those who keep him safe, weren’t around. For all he knew, we were abandoning him. I couldn’t nurture my infant like I wanted, the first few days I was discouraged from holding him, and subsequent days when I would come to the NICU, I felt like a bystander, a guest rather than his mother. I was also in significant pain from my C-section which made it difficult to move around. And it was Christmas. And my 40th birthday was Christmas Eve. I spent the holiday in tears thinking about my infant laying alone in a bassinet in the hospital with no one to comfort his cries. Then, when the festivities were over and we tried to go see him, my toddler cried and screamed for us not to leave. Things were chaotic and out of control and I was needed in all places at all times. I wasn’t getting space to process that we actually had another baby, to heal from my surgery, or to just bask in the warmth of our beautiful growing family. I was also terribly sleep deprived, furiously pumping trying to keep up my milk supply. It was like we were running a marathon with no end in sight. All I wanted was to have my baby home, to rest on the couch, feeding and doing skin-to-skin, with everyone together. When we were finally able to take Cole home, I wasn’t prepared to then have to re-acclimate our life yet again, this time with the baby at home, and me being even more sleep-deprived with wake-ups about every two hours. I wasn’t ready for the mental fog and the feeling of being borderline insane that occurs when you don’t sleep for longer than 4 hours at a time for MONTHS. Combine that with needing to return to work only six weeks after baby comes home from the hospital, and life feels impossible. I was not emotionally ready to return to work, take care of a newborn, and ALSO write a blog. Last night I actually got 4 hours of sleep in a stretch. So I am feeling better than usual. I am eager to share my experiences as a mom of a NICU baby, but I must tie up the loose ends left by my last blog post. 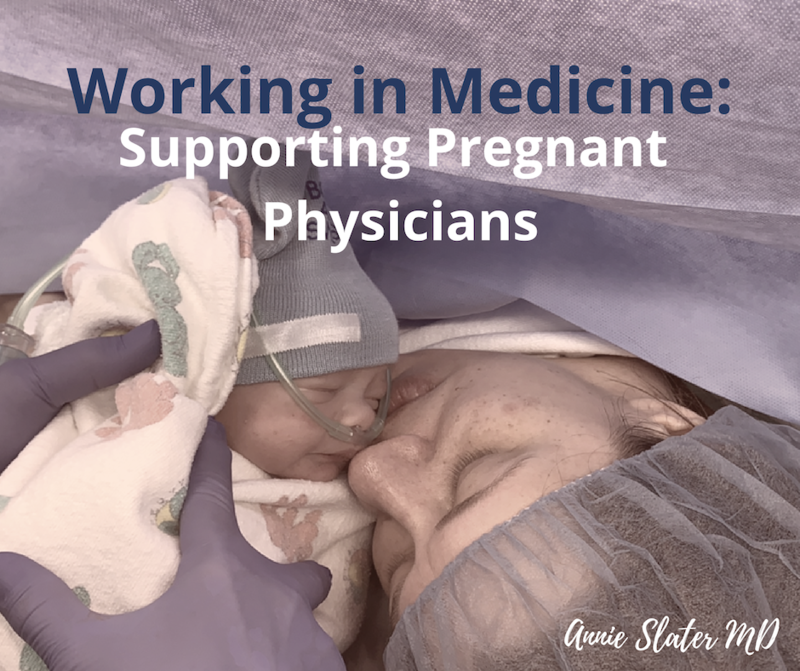 This latest post (that is 4 months late) is the one where I was supposed to talk about what pregnant physicians need. How we should advocate for ourselves so we can take better care of our pregnant body and our unborn babies. Pregnancy is crazy hard and being a new mom is also really hard. As physicians we have learned ways of minimizing our needs and coping with life struggles that don’t really serve us. We constantly under-prioritize our own health and well-being, priding ourselves on needing little or no help. In actuality, we probably could get through these challenging times much better if we feel like it is acceptable to have needs and ask for help. This doesn’t apply just to pregnancy, but illness of family members, stress at work, etc. So instead of saying what we ‘should do,’ to support our pregnant colleagues, I am going to talk about things we SHOULD NOT be saying to ourselves or to our pregnant friends who may be in similar situations. 1. I don’t need anything—As much as we sometimes don’t want to believe it, we DO need things. We need to eat. We need to sit down sometimes. We need to slow down a little. We need naps when we have the opportunity. We also need to take better care of ourselves and our bodies while we are pregnant. 2. I can do it—I hate this phrase, particularly because it is one thing that enters my mind 1000 times a day. It entered my mind so much when I was pregnant, it was like for some reason I felt I could be super human, and not always take the appropriate precautions a pregnant woman should. I think some of this was proving that pregnancy didn’t incapacitate me, that I was strong or capable or superior in some way to not need help. In reality, this is NOT the time to be the hero. You can’t see all the patients. You can’t go into the room with the patient who has CMV, or flu, or whatever infectious disease is circulating. You can’t work if you are vomiting non-stop. You also really shouldn’t be doing all of the sedations with the X-ray machine. You can’t carry that heavy equipment, and you shouldn’t volunteer for all the extra shifts. This is the time where it is OK and entirely understandable to take a pass. 4. Don’t worry about me—We should all care and worry about our pregnant colleagues. Working in medicine (in most areas) can be a bit of an occupational hazard with long hours and precarious situations (x-ray machines, viral illnesses, combative patients). Stating that we are not to be worried about minimizes our situation, which is exactly what I am seeking to avoid. Our situation should be taken into consideration. In addition to all of the above, we should be advocating for 6 months of maternity leave. It might sound egregious to some of you, but let’s discuss my situation. I took leave early, out of fear of the likely possibility that I would start hemorrhaging on a shift. My baby and I were at a significant risk for this. Despite precautions, I started bleeding again at 33 weeks and I had an urgent C-section. Baby was surprisingly large and healthy, but still spent 3 weeks in the hospital. I feel fortunate to have been able to take home home so early, as I was told to expect him to be there until his due date. I had a total of 12 weeks of maternity leave, and I went back exactly 3 months after I started my leave with bleeding. This was 6 weeks after baby got home from the hospital. He was 9 weeks old, but only 4 weeks post due date. So the most fragile of my two babies only had me at home for 6 weeks. Not only did this feel really early, I felt even more uncomfortable about leaving him because of his prematurity. There was no option other than unpaid leave. I shudder to think what would have happened if my baby had been 30 weeks, or 25 weeks. What if he had been really sick? How would I have managed returning to work? What about the moms that actually have to make this decision? We should be better at supporting families, from a societal perspective, but also from an occupational perspective. We as physicians should collectively take better care of ourselves and our families. It is what we want for our patients, so we should advocate it for ourselves, too. Do any of you have experiences like I have had that you would like to share? Thanks for sticking around! I hope to be back to some regular blogging in the near future….. Thank you Sally for sharing. It has been an arduous few months, but is sure feels good to get back to blogging. It is almost like it is a litmus test to how I am feeling! That new-mom fog is no joke. And yes, every day we are all alive is a GREAT day! My beloved MD Sisters. Please listen to your hearts and first and foremost take good care of yourself. Then you are able to take care of your families and after that your patients. We have to rise as women, demanding long enough maternity leave to take both care of the newborn and our selfs. Do you have a union that can support you? How can you raise your voices? I am so grateful of the conditions for our standards in Denmark. Here is a link for your inspiration. Thank you Annie for being so honest. You deserve a big hug and lots of love. Thank you for sharing this. All woman need to learn we can’t do everything ourselves and it’s ok to ask for help. We are always trying to prove to others how amazing we are, and they already see it!! You are an amazing woman, doctor and mother!! Congratulations and try and take a little time for yourself! Annie, after winter comes spring…in nature as well as in family life. Gonna be a grand spring/summer with Cole crawling & JP running around.